FSU Colors Beaded Earrings - GO NOLES! Great Game Day Earrings! 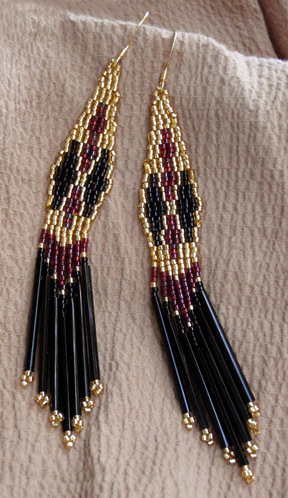 These earrings are authentic Native American made with high quality Delica seed beads in a brick stitch pattern using garnet, white and gold with black Bugle Beads. The total measurement of the beaded portion is 4 inches long(including the ear hooks 4 1/2). These earrings have gold plated hooks for pierced ears.